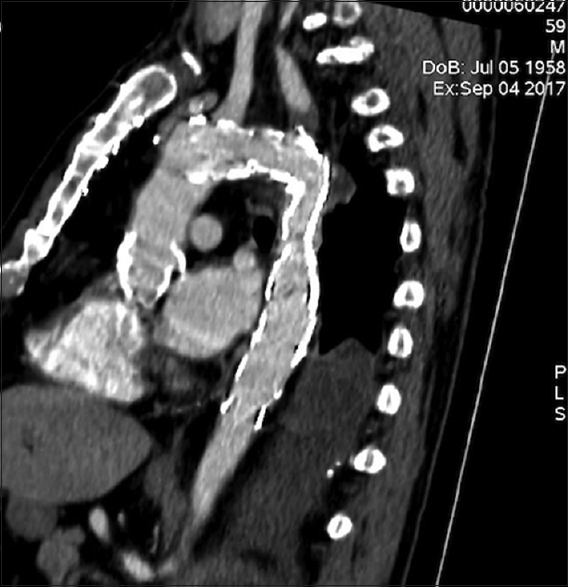 We present a case with aortic rupture during an operation of thoracic endovascular aortic repair of an anastomotic pseudoaneurysm. This happened after the use of a low-pressure remodeling balloon inside the covered part of the deployed endografts. It was successfully treated with a second more centrally in the aortic arch-implanted endograft with full coverage of the left subclavian artery orifice. This patient had a history of surgically operated aortic coarctation. Thoracic endovascular aortic repair (TEVAR) is an established technique for aortic pathologies, but sometimes this may be a lifesaving procedure. In this article, we would like to describe an interesting case treated in emergency setting. A 59-year-old male (182 cm, 100 kg) was operated 42 years ago for an aortic coarctation with descending thoracic aorta resection and end-to-end anastomosis of a synthetic graft. An aortic root replacement with a biological aortic valve was performed 9 years ago for a stenotic bicuspid aortic valve and ascending aortic aneurysm. Recoarctation and presence of a large pseudoaneurysm at the level of previous operation anastomosis were diagnosed in a routine computed tomography (CT) scan [Figure 1]. Clinical gradient between the right arm and legs was 55 mmHg. The endovascular procedure was performed with local anesthesia. A peak invasive systolic pressure gradient of 55 mmHg was assessed between the distal part of ascending aorta and the descending aorta distally. An angiographic catheter (pigtail 5 F) was placed in ascending aorta through a left brachial artery approach, and multiple planes angiography was performed, confirming the preoperative CT scan data, such as a recoarctation with a minimal diameter of 15 mm, and a pseudoaneurysm at the level of the proximal anastomosis site just a few millimeter distally from the left subclavian artery (LSA) orifice. On the basis of CT measurement, an over-sizing of 15% was applied in the choice of stent-graft diameter. An open cut femoral artery approach was performed, and after the placement of an angio-sheath in the femoral artery, an ultra-stiff, 0.035-inch guidewire (Lunderquist ultrastiff; Cook Medical Inc., Bloomington, Indiana, United States of America) was advanced into the ascending aorta through a vertebral 5F catheter (Merit). After the angiographic mapping [Figure 2], an Ankura thoracic stent-graft (Lifetech Scientific, Shenzhen, China) 26 mm proximal diameter, 26 mm distal diameter × 160 mm length, with a free-flow proximal end (uncovered) was carefully advanced over the Lunderquist extra-stiff guidewire under fluoroscopic guidance with its proximal covered part being placed at the distal half of the LSA orifice, to cover at least one-third of it, as the proximal landing zone between LSA and the anastomotic pseudoaneurysm was quite short (10 mm approximately). A poststent graft deployment angiogram showed that the stent-graft was placed a few millimeters more distally than the initial plan, with its proximally covered part landed just after the LSA's orifice end without covering partially the LSAs origin. A remodeling balloon catheter 36 mm max. Diameter (Coda/Cook) was positioned inside the previous deployed thoracic stent graft (Ankura/Lifetech) at the level of the recoarctation and started to be filled with contrast media and saline water with the use of two filled 20 ml syringe to dilate the aorta stenosis. Immediately after the first 20 ml syringe filling of the remodeling balloon, our patient presented an acute worsening tachycardia, hypotension (systolic blood pressure <60 mmHg), and hypoxia requiring emergency intubation. Rapid fluids administration was infused from the central venous lines that were already placed before the beginning of the operation. An emergency thoracic aorta angiogram was performed that showed contrast media extravasation in the left hemithorax just after the LSA origin at the level of the proximal surgical anastomosis [Figure 3]. Due to this life-threatening condition was decided, the emergent implantation of a second tapered thoracic stent graft (Ankura 3026 × 160, LifeTech Scientific) which was immediately delivered and deployed into the aortic arch between the left common carotid artery orifice and the previously implanted stent graft, covering completely the LSA origin. 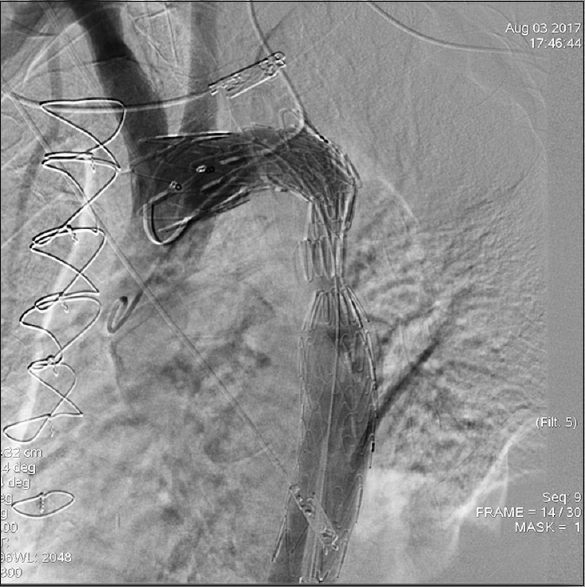 Likely in our case, there was an adequate proximal landing zone for the second stent graft implantation due to the native long distance of the left carotid artery origin from the LSA. 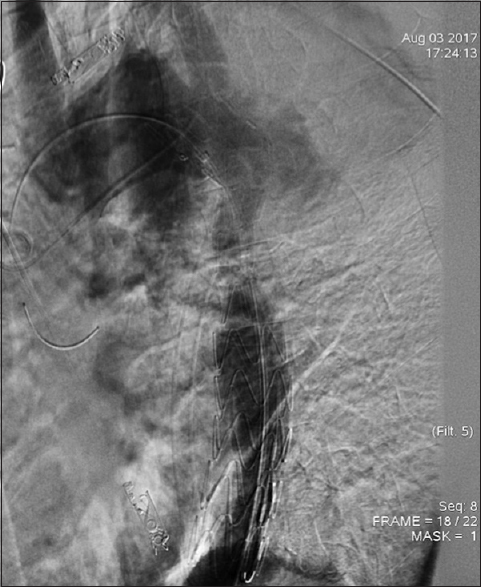 The second stent graft postimplantation angiography showed no contrast media extravasation with normal flow to the descending thoracic aorta [Figure 4]. To secure the patient's condition, an angiographic catheter was advanced through the left brachial artery at the level of the LSA orifice, and an angiogram was performed showing no filling of the pseudoaneurysm sac and no contrast media extravasation from this point [Figure 5]. Patient was transferred to the Intensive Care Unit and a left hemithorax drainage tube was inserted under direct vision. An effusion of 2.000 blood was drained. After stabilization and extubation of the patient, a new CT angiography was performed confirming the sealing of the aortic rapture without contrast media extravasation and no evidence of any kind of endoleak. 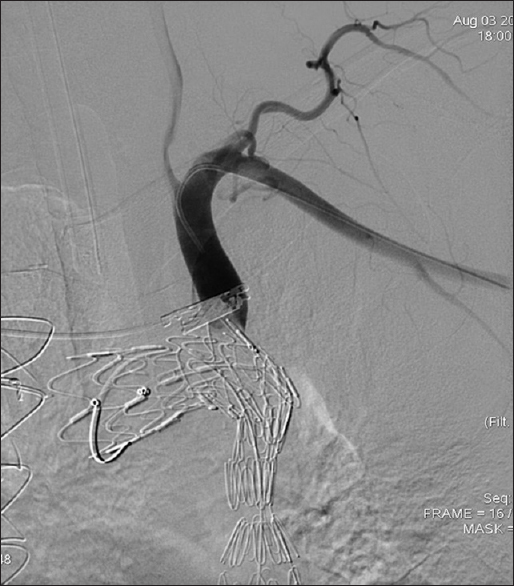 Patient's clinical condition rapidly became uneventful and was transferred in the Cardiac Surgery Department 3 days later with no neurological symptoms and no signs of left arm ischemia, so no left carotid LSA bypass was performed. Finally, the patient was dismissed from the hospital 10 days after the operation in good shape with no neurological or other kinds of complication. We also completed a 30-day postoperation follow-up with a new CT scan which also showed normal stent-grafts patency, with no endoleak and total thrombosis of the pseudoaneurysm with diminished diameter [Figure 6]. Open surgical treatment of coarctation has excellent primary results. Although late incidence of aneurysm after open surgical repair is 11%–24%, it is complicated with high morbidity and mortality rates.,, Conservative treatment is associated with a 100% rate of rupture within 15 years. The incidence of pseudoaneurysm is more frequent after patch plasty. False aneurysms tend to arise at the site of suture lines or aortic isthmus restenosis, whereas true aneurysms usually develop at the opposite site of surgical patch. Despite the improvements in surgical techniques and postoperative care, conventional surgery for reoperations on the descending thoracic aorta is still associated with marked morbidity and mortality rates. Surgical reoperation in adults (our case was 42 years after the initial operation) poses risks mainly due to comorbidities and the necessary surgical technique as cardiopulmonary bypass, hypothermic circulatory arrest, or partial circulatory support. It is mentioned a 13.3% of operative mortality. Even with excellent results reported from some authors, the morbidity and rate of complications remain high. Recently, with the technical advances made in the thoracic stent graft systems production and the globally gained experience of the medical community in the field of endovascular procedures, the treatment of such thoracic pathology in endovascular way appears a valuable feasible and quite safe alternative to the open repair treatment. Rupture of the thoracic aorta during TEVAR treatment of a pseudoaneurysm following previous open surgery for coarctation can be a fatal complication. Previous reports with small series report no incidence of rupture during the procedure although the median age was 31.5 years (range: 24–38) or mean age: 45.7 ± 13.6 years (range: 29–66). It is estimated that fatal aortic rupture during implantation is underreported. There have been reported 23 fatal cases., The incidence of rupture can be explained by the fact that there are two different elasticity zones in aortic anastomotic wall; a scar tissue after an end-to-end anastomosis or plasty of operated coarctation and a pathologic zone proximal and distal of the scar. There are findings that prove that a cystic medial necrosis represents a consistent histologic feature of the aorta in these patients. An additional risk factor is an abnormal arterial compliance. Advanced age is considered also a risk factor for rupture, likely secondary to aortic wall calcification and consequently diminished aortic elasticity. To reduce the risk of catastrophic rupture, the prospective US protocol for coarctation of the aorta stenting included a test to assess the compliance of the coarctation lesion, as described by some groups. A predilation is performed using a compliant balloon dilated up to 80% of the final diameter of the stent (or 2 mm smaller) at low pressures (<4 atm). This maneuver is intended as a diagnostic measure, not as an angioplasty before stent placement. 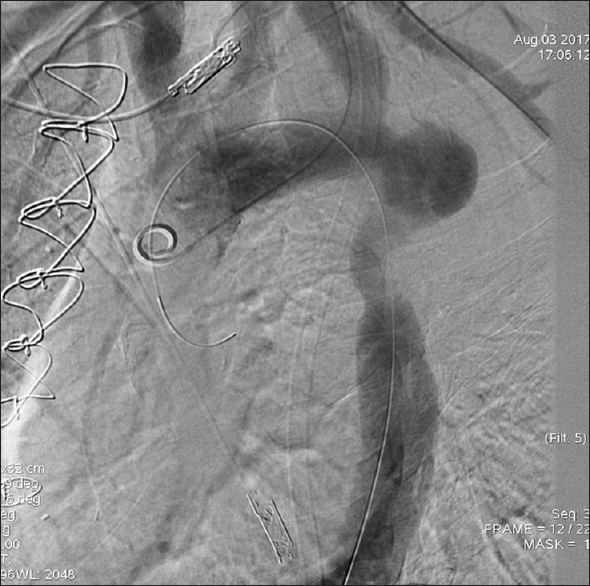 The disappearance of the waist on the balloon diagnoses a compliant lesion, which is in turn amenable to stenting. For this reason, maybe it would be safer the use initially of a low pressure balloon and in a second catheterization later to proceed to the complete widening with a high pressure balloon. In any case, it is important to keep a stable guidewire position. Our patient was a previously (42 years ago) operated isthmic stenosis case, and a remodeling balloon (which is considered a low pressure balloon) was used after the first stent graft deployment inside the covered part of the graft and was filled by hand using a 20 ml syringe in just half of its total capacity. Surprisingly, despite our gentle manipulation, an aorta rupture happened at the level of the surgical anastomosis showing a very limited compliance of the anastomotic tissue. To our opinion in these kinds of cases, a more extensive coverage of the previous surgical anastomosis with a thoracic stent-graft should be decided already in the preoperative planning of the procedure, even if this means the full coverage of the LSA orifice, to avoid possible catastrophic complication such as an aortic rupture that can be fatal for the patient. Another issue to keep in mind is that endovascular repair of thoracic aorta pathology requires long-term imaging follow-ups to verify the durability of the implanted stent-graft and to detect possible complications such as endoleaks. Although CT scan imaging is the gold standard method for this kind of postoperative follow-up, there is a cumulative radiation in all these patients, especially the younger of them and magnetic resonance imaging could be a valuable alternative, especially after the initial follow-ups that should be performed by CT scan anyway. Endovascular repair of pseudoaneurysms following open surgery for aortic coarctation is a promising and less-invasive alternative to open re-do surgery, but maybe more extensive coverage of the proximal surgical anastomosis should be performed by the endografts. Yet, more patients and longer follow-ups are necessary to assess the efficacy of this therapeutic approach. von Kodolitsch Y, Aydin MA, Koschyk DH, Loose R, Schalwat I, Karck M, et al. Predictors of aneurysmal formation after surgical correction of aortic coarctation. J Am Coll Cardiol 2002;39:617-24. Knyshov GV, Sitar LL, Glagola MD, Atamanyuk MY. Aortic aneurysms at the site of the repair of coarctation of the aorta: A review of 48 patients. Ann Thorac Surg 1996;61:935-9. Ala-Kulju K, Heikkinen L. Aneurysms after patch graft aortoplasty for coarctation of the aorta: Long-term results of surgical management. Ann Thorac Surg 1989;47:853-6. Gudbjartsson T, Mathur M, Mihaljevic T, Aklog L, Byrne JG, Cohn LH, et al. Hypothermic circulatory arrest for the surgical treatment of complicated adult coarctation of the aorta. J Am Coll Cardiol 2003;41:849-51. Forbes TJ, Garekar S, Amin Z, Zahn EM, Nykanen D, Moore P, et al. Procedural results and acute complications in stenting native and recurrent coarctation of the aorta in patients over 4 years of age: A multi-institutional study. Catheter Cardiovasc Interv 2007;70:276-85. Marcheix B, Lamarche Y, Perrault P, Cartier R, Bouchard D, Carrier M, et al. Endovascular management of pseudo-aneurysms after previous surgical repair of congenital aortic coarctation. Eur J Cardiothorac Surg 2007;31:1004-7. Botta L, Russo V, Oppido G, Rosati M, Massi F, Lovato L, et al. Role of endovascular repair in the management of late pseudo-aneurysms following open surgery for aortic coarctation. Eur J Cardiothorac Surg 2009;36:670-4. Eicken A, Georgiev S, Ewert P. Aortic rupture during stenting for recurrent aortic coarctation in an adult: Live-saving, emergency, nuDEL all-in-one covered stent implantation. Cardiol Young 2017;27:1225-8. Isner JM, Donaldson RF, Fulton D, Bhan I, Payne DD, Cleveland RJ, et al. 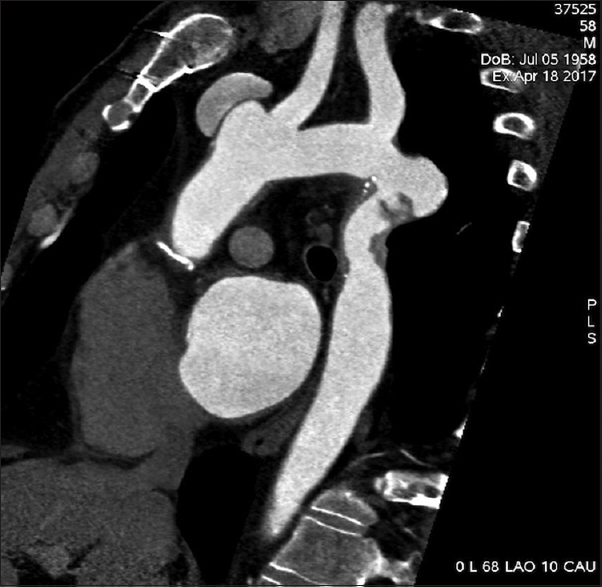 Cystic medial necrosis in coarctation of the aorta: A potential factor contributing to adverse consequences observed after percutaneous balloon angioplasty of coarctation sites. Circulation 1987;75:689-95. Qureshi AM, McElhinney DB, Lock JE, Landzberg MJ, Lang P, Marshall AC, et al. Acute and intermediate outcomes, and evaluation of injury to the aortic wall, as based on 15 years experience of implanting stents to treat aortic coarctation. Cardiol Young 2007;17:307-18.